KABUL, Afghanistan – The discovery of an Islamic State hideout filled with explosives and suicide vests in a poor Kabul neighborhood reflects the failure of Afghanistan’s corruption-wracked government to protect the capital, analysts and residents said Friday. This week’s revelation that militants were operating in Kabul’s western Qala-e-Wahid district follows a recent series of horrific attacks in the heavily guarded city that killed nearly 200 people and wounded hundreds more, including foreigners. 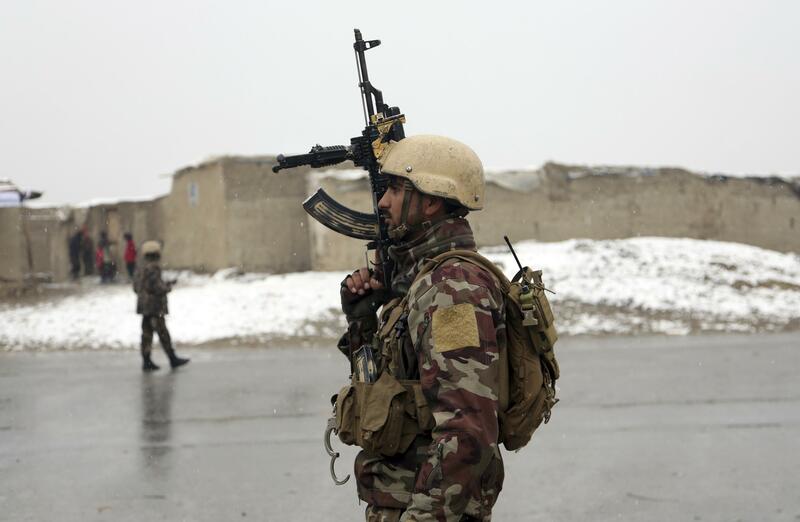 Security forces were led to the safe house by an insurgent who was captured during an attack Monday by IS militants on a military academy in Kabul in which 11 soldiers died, according to an intelligence official. From behind the 10-foot green metal doors, the insurgents were plotting to use the explosives, weapons and suicide vests in three more large attacks in Kabul, the official said. He spoke on condition of anonymity in line with his agency’s rules and did not elaborate on the plans. Khan Mohammed, a resident of Qala-e-Wahid, told the AP that locals rarely see a police patrol in the neighborhood and stay at home after dark because of marauding gangs of thieves. They say the government can’t provide security. “It is dangerous for all the people of Qala-e-Wahid that Daesh was here, but they came here because it is an insecure area,” Mohammed said, using the Arabic acronym for the extremist group. “For Daesh, this was the perfect area because you can bring everything here from anywhere,” added Mohammed, whose home is across the lane from the IS hideout. Political analyst Haroon Mir blamed widespread corruption throughout the government and the security forces for their inability to prevent the recent deadly attacks in Kabul, which included a siege at a luxury hotel and a car bomb packed inside an ambulance. “It is the utter failure of the intelligence services. It is the utter failure of the security services. It is the utter failure of every institution,” Mir said. “You can’t blame it on lack of resources or lack of international support,” he said, adding that billions of dollars in international money flowing into Afghanistan in the past 16 years has been siphoned off by those in positions of power. That has left most Afghans feeling vulnerable. The streets that weave through Qala-e-Wahid are rutted and ankle deep in mud. A wide open sewer runs the length of the lanes, clogged with garbage bags, mounds of trash and human waste. Foreigners are eyed with suspicion by some residents who refused to identify the IS safe house. There are whispers of possible IS sympathizers in the neighborhood. Other residents who are willing to talk say the dangerous men in their neighborhood come from many places because the security services are nonexistent. Zikarullah, a 15-year-old who lives in a sunbaked mud-and-straw home opposite the IS hideout, said the three men and one woman who occupied the safe house had moved in about 25 days earlier. They had engaged freely with the neighbors, he said. “One of them asked me if I liked cricket and said he would buy me a new cricket ball and bat,” said Zikarullah, who like many Afghans uses only one name. The occupants were young, and the woman always wore an all-enveloping burqa. Another neighbor, 16-year-old Samsor, said the woman carried the explosives and weapons under her burqa. “The police told us this after they arrested them and they told us they were from Nangarhar,” Samsor said. Afghan security forces, aided by the U.S.-led coalition, have been targeting suspected IS hideouts in Afghanistan’s eastern Nangarhar province, where the militants are believed to have established their most extensive bases. Increasingly, however, IS has gained in strength in northern Afghanistan, where ethnic Uzbeks have been recruited into their ranks. There are an estimated 5,000 IS fighters in northern Afghanistan between Sar-e-Pul province and eastern Badakhshan province, said Brian Glyn Williams, the author of “Counter Jihad, The American Military Experience in Afghanistan, Iraq and Syria.” He cited Afghanistan Vice President Rashid Dostum for the statistic. President Ashraf Ghani, who faces pressure over the security lapses, went on national television Friday to blame neighboring Pakistan for harboring Taliban militants. Pakistan routinely denies it is a hub for the Taliban. Ghani also said he has called for a review of security arrangements in Kabul. Mir, the political analyst, said terrorism is a new source of income for some of the poorest residents of Kabul. He said some can earn up to $4,000 to spirit a suicide bomber into the city. The deteriorating security can also be blamed on the protracted feud between Ghani and powerful warlords, including Dostum, who currently is in Turkey and prevented by the government from returning to Afghanistan. Ghani has fired the powerful Tajik warlord Atta Mohammed as governor of northern Balkh province, but he has refused to step down. Published: Feb. 2, 2018, 9:51 a.m. Updated: Feb. 2, 2018, 7:52 p.m.